Don't leave yourself exposed to expensive service costs of fire extinguishers. 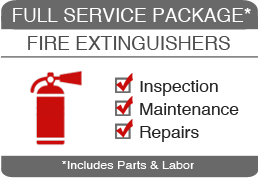 After the fire extinguisher is inspected any corrective actions where needed such as repairs or maintenance are also completed. Non-compliant extinguishers are replaced on the spot. Extinguishers will then be given a tag and be compliant for one year. Our full service package comes with guaranteed compliance. Order Online Now or Talk to An Agent (773)819-2979.